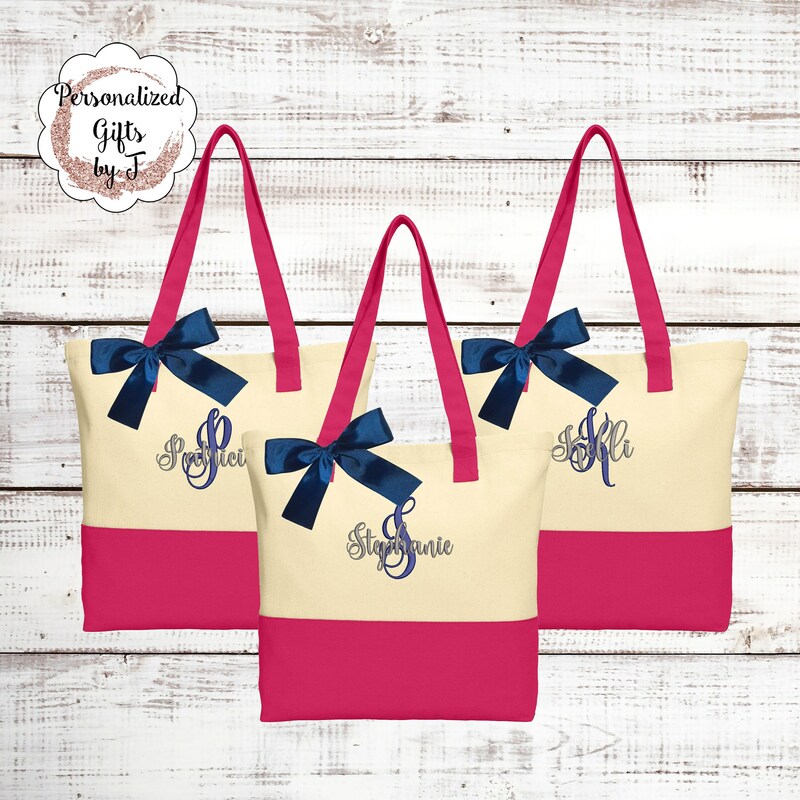 Use these fun personalized totes for your bachelorette party, bridal luncheon, or at your wedding! 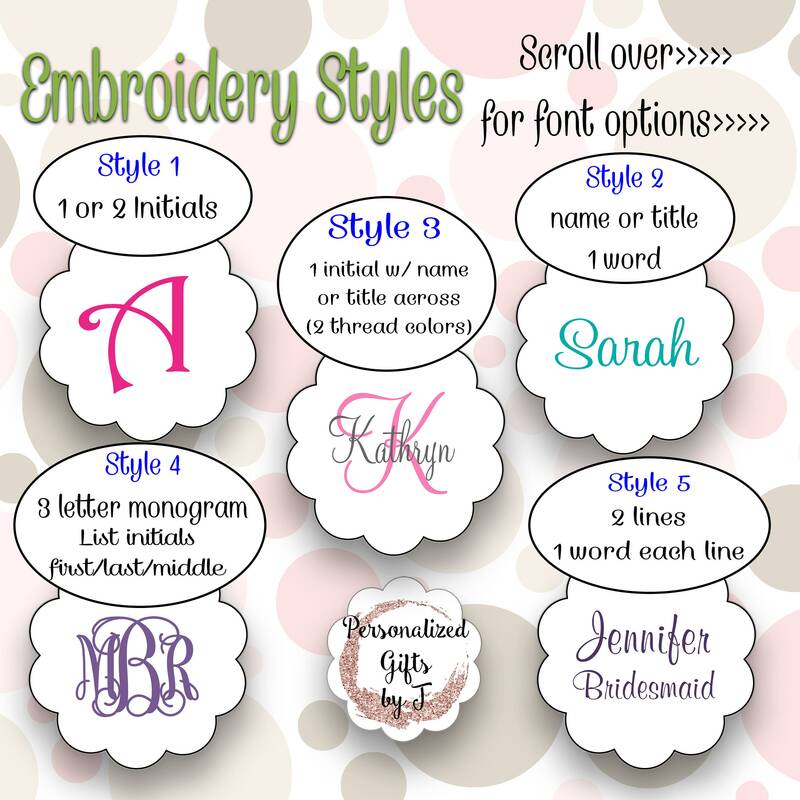 You can choose your EMBROIDERY STYLE (with or without bows) from the drop down menu. 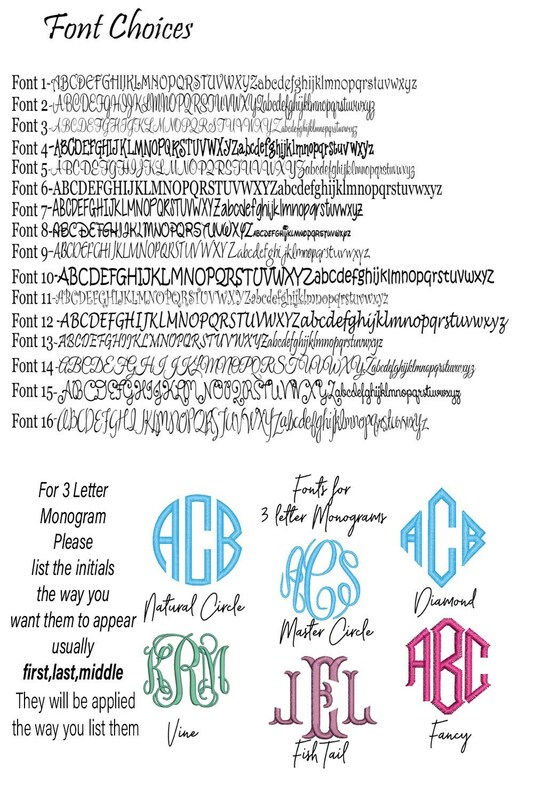 Style 4- 3 Letter monogram (List your initials First/Last/Middle) I will apply them the way they are listed. We will try to contact you if you have missed anything. But this may delay your order. 3.) 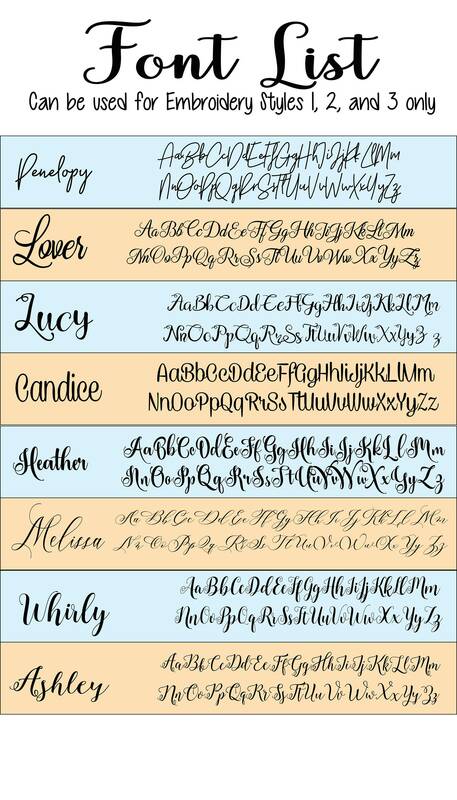 Personalization information- Initial, Name, etc. 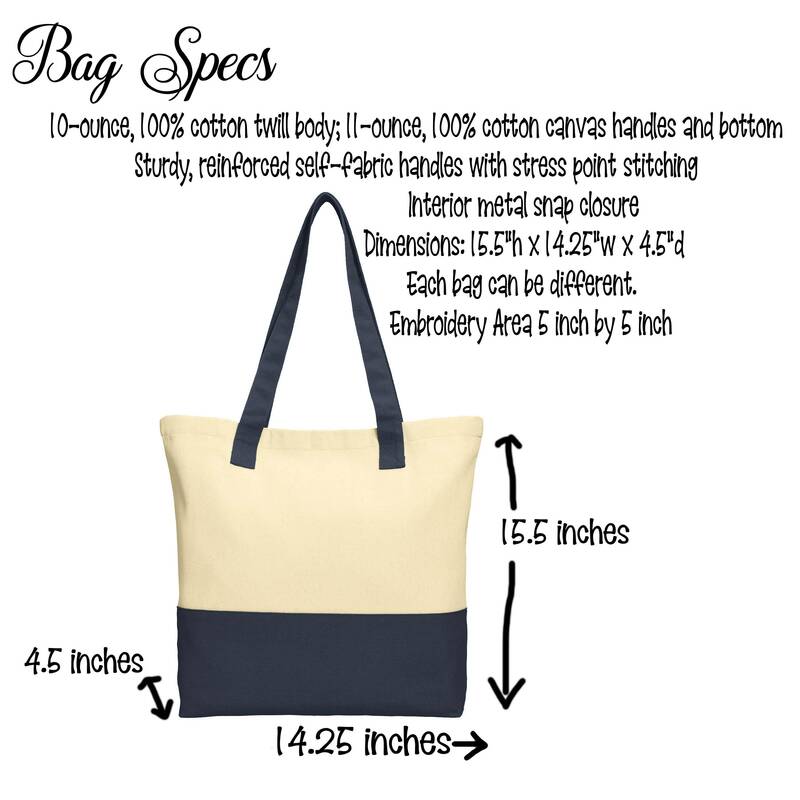 You can add a line of embroidery to any of these of the above options for for 4.00 extra per bag. 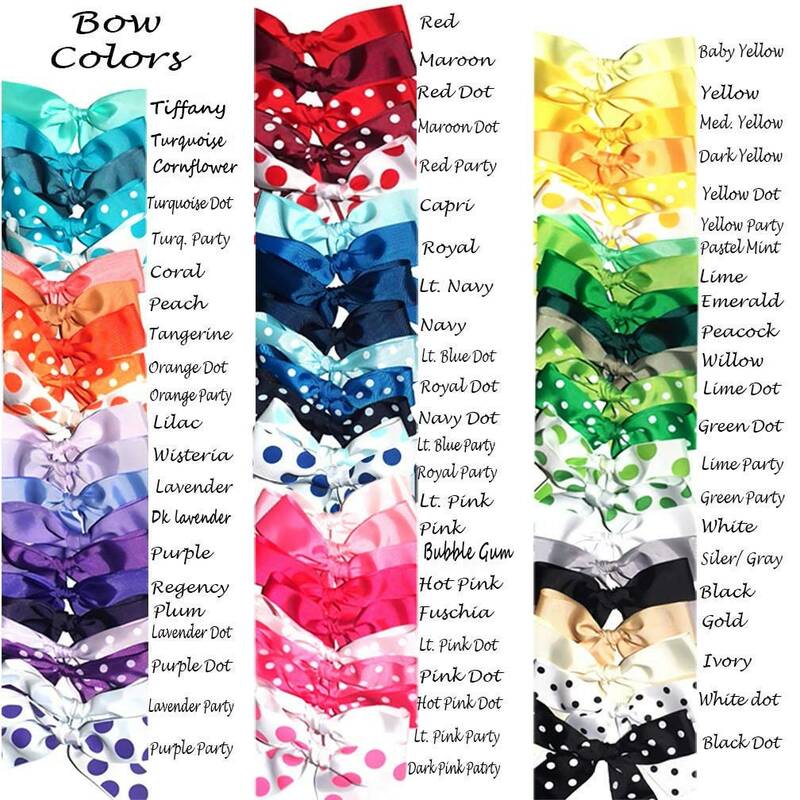 Bows are 2.00 each. They are made of 1 1/2 inch gross grain ribbon and are approximately 6 inches across. They attach with a safety pin so you can adjust them or remove them if you have to wash your tote. > All orders are shipped using USPS Priority (1-3 days) or First Class (1-10 days) mail. Shipping times are in addition to production time. > Each order will have a tracking number once shipped. You will see this both through Etsy and an email as it ships. > Hand wash or wash on gentle cycle with like colors. > DO NOT use ~bleach~ or ~fabric softener~ as this could affect the longevity. While we attempt to represent all colors accurately, there can be a slight variation in colors due to individual screen resolution. We change suppliers of materials (thread/vinyl/ribbon) from time to time. So if you have a previous order you are trying to match... please let us know so that we can try to match it as close as possible. PLEASE allow 3-4 weeks production. Then 2 to 5 Days shipping. In some cases we are able to ship these before the current processing time. ✿ All contact about this order will be made through Etsy convo. If I need additional information from you, or you need to contact me about your order, make sure to use Etsy convo. I do not check Email. 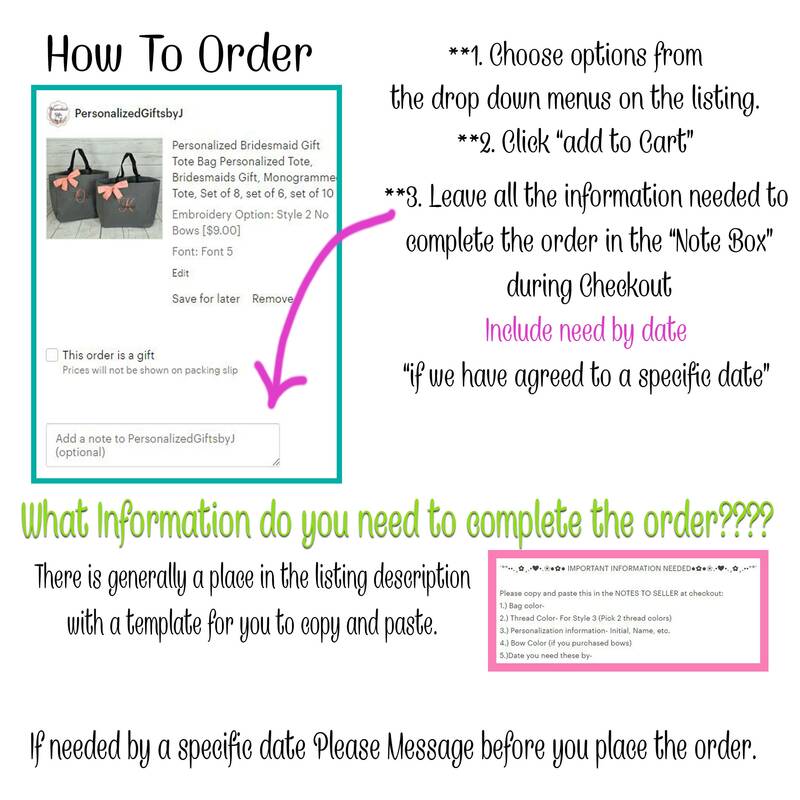 I do this to keep all information about your order in one place. Less mistakes are made that way. ●✿● Please make sure the address you checkout with on Etsy is correct. I only ship to the address provided during checkout and am not responsible for changes thereafter. When will I get my items? ( I understand this is long to most ) But please understand we receive orders for over 250 pieces a day to be personalized , we run 8 embroidery machines 8 to 10 hours a day, in order to keep our prices low and affordable to everyone, this ship time is necessary. If you need your items sooner please message us before ordering to see if we can accommodate. I have a problem with my order. How can we fix it? Please check your order as soon as you get it. You have 7 days from the receipt of your order to let me know if something is incorrect or missing. *	1-2 Sentences describing what the problem is. Once we receive your message, we will check to see if the wrong items were shipped to you by accident or if anything was misprinted due to an error on our end. If the mistake was our fault we will provide a solution at no expense to you. If the mistake was made on the customer’s end, we can still provide them with replacements. However; the customer must pay all extra charges including shipping. What if I made a mistake in my personalization details? Please double and triple check your personalization information before you place the order. Once the order is sewn we can not change anything. 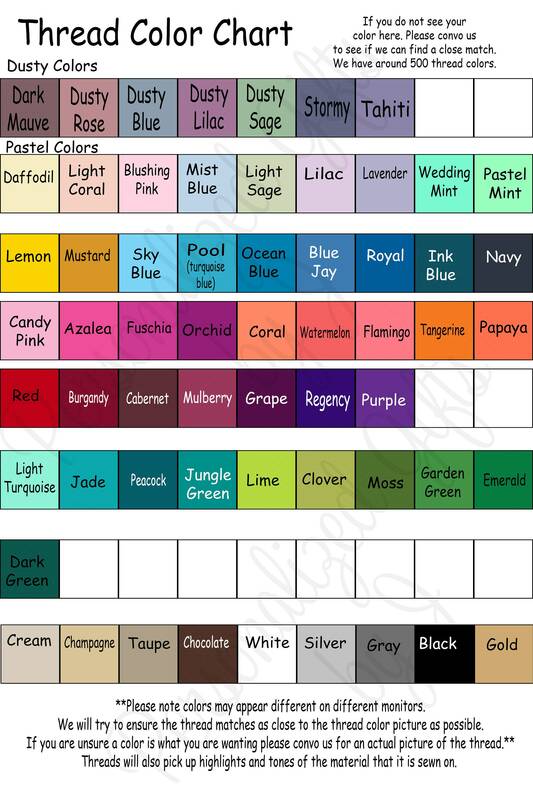 What if I am unsure of my colors, font, etc? Please ask any questions regarding colors, fonts, etc. before you purchase. We will gladly send you pictures of the actual products being used, entire fonts, and of course you can always purchase proofs. To keep cost down and production times fast we do not provide proofs with every order. However you can purchase proofs. They are 3.00 each. It will also add 7 days to your production time. Can I return or exchange my items after I receive it ?